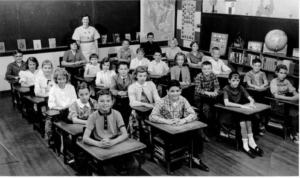 In the 1950s classroom, all of the classrooms were arranged with desks in perfect rows, occupied by children dressed in perfect outfits and perfect penny loafer shoes, eager and ready to learn from their teacher, the main component in the front of the classroom. (Wouldn’t it be great sometimes if we could have those straight rows and bolt the child’s desk to the floor so nobody will move or wiggle??) In the 1950s, auditory learning and processing and regurgitation of information were the main focus. The teacher was the giver of all the information and the child politely complied with what the teacher asked. Today’s classroom is almost the complete opposite of what we saw in the 1950s. 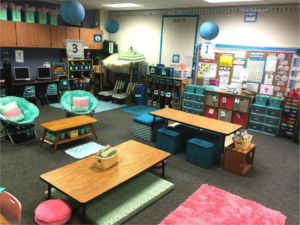 Today, flexible seating is the goal for most classroom, where kids have the option to sit in several different ways as they learn or collaborate together – at a low table, on a carpet, on a ball chair, in the lounge chairs that sit back under an umbrella (almost makes you want to get out the sunglasses and fruity beverage!). The classrooms today have clearly changed, but the learner has also changed. In the 1950s, 90% of children were auditory learners, but today, less than 10% of students are auditory learners. Today’s learners are very interactive and hands-on, based on the way that they have grown up and the way that their mind has shifted. Parenting has also changed. When parents come to the office to talk about their child’s report card, we can very clearly see a shift from the 1950s and 1960s to today. Then, the parents would look to the child and ask, “What happened here? Explain these grades,” while the teacher looked on providing information when needed. Fast forward to today, and parents ask that same question of the teacher, blaming them for the child’s grades, while the child innocently stands back and lets the adults deal with their grades. What is the problem in education today? While there are many facets and issues at play, one of the major issues is that the teacher-directed classroom isn’t very effective for the kinds of learners we have today. In the past, we’ve blogged about some ideas for helping kids transform into a 21st century learner, but how do we as teachers respond to the shift in learning styles by shifting our mindset towards more student-led instruction? If you haven’t seen it before, take a second to watch this video – it’s great! We have to help kids be able to think about ways they can ask questions of themselves to help improve their metacognition. As students approach a task, they can ask: Is this similar to a previous task? What do I want to achieve? What should I do first? 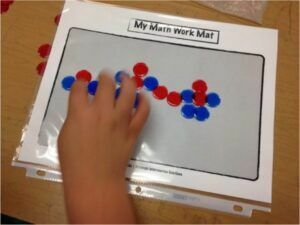 During an activity, they can still be asking questions of themselves to help them develop awareness of their metacognition: Am I on the right track? What could I do differently? Who can I ask for help? Finally, they can reflect on the task: What worked well? What could I have done better? Can I apply this to other situations? Let’s be honest, kids in the 21st century don’t look at what they should do before, during or after anything! Many of the kids today who are stuck on the escalator are there because of helicopter parents that constantly make decision for them, to the point where they don’t know how to make decisions on their own. Therefore, in the classroom, we really need to help kids learn to move forward on their own. We want students to learn to gather their own information and figure out how to use it as they drive their own instruction. If students are the ones gathering the information then they’re the ones learning it and student-driven learning cements lessons into the students’ minds making any lesson more powerful with this strategy. Questioning. How are we questioning kids? Are we asking them open-ended questions or leading questions? During a guided reading group, many of the questions we ask are open ended. You ask them to inference, to draw conclusions, and talk about the things that they’ve learned. However, in our other subjects, we often lead students through the questions, partly because of time. We have a hard time asking questions we know we need to ask to help students process. Questions like: Can you explain this to me? What led you to your answer? Can you tell me more about that? What did you start with? What strategy did you use? Is there another way that you can solve it? 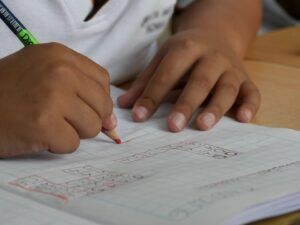 By asking open-ended questions, we can help kids start to build that questioning of metacognition, not just answering yes, no or multiple choice questions. 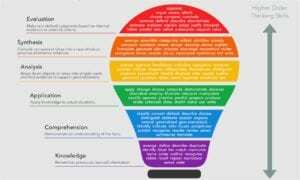 Though it isn’t quite as popular anymore, clear the cobwebs off your old Bloom’s Taxonomy! Are we just asking kids knowledge and comprehension questions or are we really bringing our questioning to the level of analysis, application, synthesis and evaluation. We want higher order thinking skills, so as teachers, we have to ask higher order questions for children to be able to access that information. Questioning in teaching and learning not only encourages students to think critically, it allows teachers to assess whether or not students understand a particular concept. To do this, the teacher to come up with a particular questions to elicit responses that are both relevant and of high standard so we can really help kids learn to explain their thinking. The Stick Pick app is great for this! For a very small fee, you can download the app for your iPhone or iPad, and then enter kids’ names like you would write on your popsicle sticks in a cup on your desk. 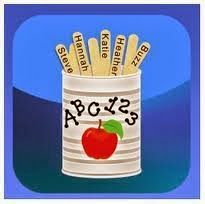 But with these sticks, each individual student can be assigned a level of Bloom’s Taxonomy or ELL. Then, when you pull out a stick, the question it asks for the prompt matches that needs of that child. What a great way to be able to subtly and effortlessly differentiate instruction within questioning. And it’s really simple! Communicated Reasoning. Are we able to critique the reasoning of others? Here’s a video of two kids doing a partner number talk with 15 + 16. One boy was explaining to the other, while working on the whiteboard, how to solve this problem with the Value Pack, which is the partial sums method. He started by decomposing 15 into 10 and 5, 16 into 10 and 6. He proceeded to add the 10s to make 20, and added the 5 and 6 to make 11. He added those two totals together to make 31. The other child then decided if he agreed with the explanation that was given and had example of another way to solve it (“I agree with the answer and another way to solve it is…”) or if he would politely disagree with the answer and then could tell how he would solve it. 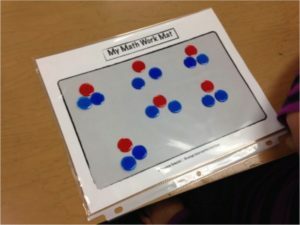 The kids in this particular video were taking a number talk, and instead of it being a whole group, it was actually turned on the students to make it very student-led, to find out if the students could solve the problems without anyone really guiding them in their practice. Listen to students speak. Perspective is everything. Sometimes we’re so rushed in education and in teaching, that we often don’t give students the opportunity to explain their thinking to the point where we can understand it. Sometimes we have an idea of what we want the outcome of our lesson to be, but if that gets derailed, it often throws us for a loop. When we look at kids’ learning, it’s really important for us to look at how they are thinking and what their perspective is. For example, I gave a task to a kindergarten classroom. I told the students that six kindergarten students were going out to play in the snow. Each student had on a red hat and blue boots. How many boots and how many hats were there in all? 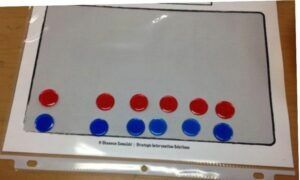 The students were given red and blue counters to show their thinking as well as the correct number of hats and the correct number of boots on the six students. 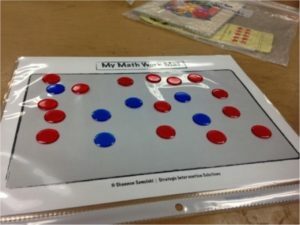 We might hope that all students would have exactly one red counter for the hat and two blue counters for the boots, and show a set of six of those laid out in a nice even row to show that they completely understood the task. In reality, we to take a different perspective as we looked at how students were accomplishing this task. One student just had a scatter of all different kinds of counters on her mat and said that she just knew it was lots of boots and hats. When we started to look at other kids’ perspective, they might have a different way of reasoning it. One of them had six red counters and six blue counters. After my first glance at this child’s work, I was sure that he didn’t understand that each person has two boots. However, upon talking to him, he said that the red counter represented one hat, so he had six red counters for six hats. But instead of using extra counters, he took the blue counter and associated it with two boots. So, as he told me the total, he said each of the blue counters was worth two and he skip counted two, four, six, eight, ten, twelve as we went through the blue counters. He replied with the answer that there were six boots hats and twelve boots needed for the six kindergarten students. That was a really high concept, but I wouldn’t have known that he was doing that if I hadn’t taken the time to look at his perspective and find out what the child was thinking. I thought one student was making flowers with the counters. But when I took the time to see her perspective, they were actually people she was making. They had a red hat, a red body that had two blue boots and two blue arms, and the people she had made were holding hands. While it didn’t seem like it, when I started understanding the child’s perspective, she was actually understanding the task very well. Do we give kids enough time to explain themselves and their understanding so that we are able to see how they are really thinking? Less is more. We’re not the giver of all the information. I love the old Chinese proverb (although some have argued that it’s from Benjamin Franklin), “Tell me and I’ll forget. Teach me and I’ll remember. Involve me and I will learn.” We want kids to be more hands-on and take more ownership of their learning in our 21st century classrooms. We can’t do this by standing at the front of the classroom and delivering a lesson like they did in the 1950s. We must really involve our students and have them become an active part of their own learning. This shift towards student-led instruction is much easier said than done, but we have to take small steps to move in that right direction. And not just in our guided reading groups, but in our math, science and social studies as well. We want to provide opportunities for students today to help move towards student-led instruction instead of teacher-led instruction, and apply inquiry-based means for students to learn about how they are thinking and processing.